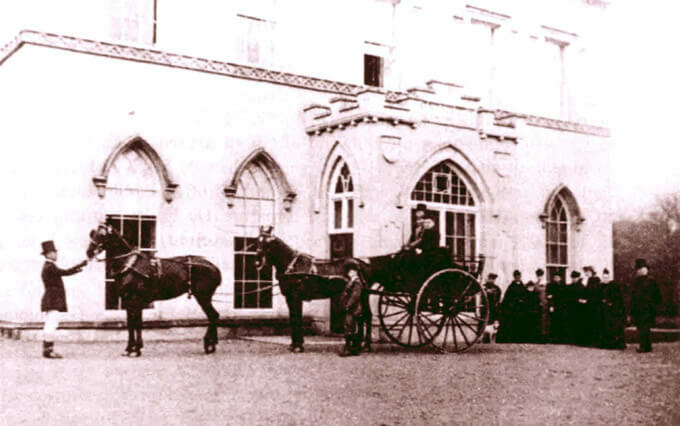 Castlecomer Discovery Park stands on the site of what was once part of the Wandesforde Estate. The Wandesforde family originally came from Kirklington near Richmond in Yorkshire. Christopher Wandesforde came to Ireland in 1636 along with the Earl of Stafford, who was then Lord Deputy of Ireland. He was granted an Estate in Castlecomer along with the titles of Master of the Rolls and Lord Chief Justice and later Lord Deputy after the Earl of Strafford was executed for treason. His son, Christopher was created a baronet and his grandson, also Christopher was named Baron Wandesforde and Viscount Castlecomer by Queen Anne. That title ended with the death of the 5th Viscount Sir John Wandesforde, who was succeeded by his daughter Anne in 1784. Anne Wandesforde married John Butler, heir to the Butlers of Ormonde and became the Countess of Ormonde. Her sons Walter and James became the 18th and 19th Earls of Ormonde while a younger son Charles inherited the Wandesforde estates and took the name Wandesforde. During the Countess of Ormonde’s time on the Estate, the coal mines were mainly run by master miners who leased the land and employed teams of about 50 men to operate them. Her son, Charles Harward Butler-Clarke-Southwell-Wandesforde, took a great interest in the running of the Estate and in the welfare of his tenants and attempted to reduce the role of middlemen by reducing rents and providing assistance. He even helped some of his tenants to emigrate. CHBCS Wandesforde was succeeded by his daughter Sarah, who married John Prior. She outlived all her children and was succeeded by her grandson Richard Henry who inherited the estates and assumed the Wandesforde name in 1892. Captain Richard Henry Prior-Wandesforde took personal control of the coal mines and invested his own money in upgrading and modernising the mine workings. Castlecomer Discovery Park is situated on grounds that once formed part of the Wandesforde family estate. 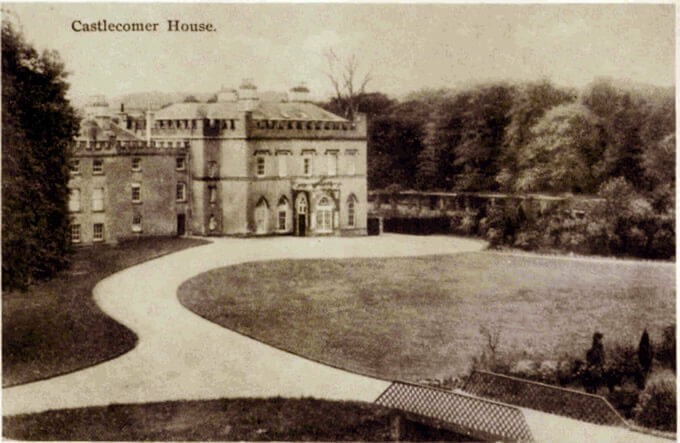 Castlecomer House, the family home was located on the opposite side of the N78 road. The original house was built in 1638 and was burned down during the Battle of Castlecomer in 1798. A bigger house was built in its place in 1802 during the time of Lady Anne Ormonde. Most of the building was demolished in 1975 as it was no longer in use and had fallen into disrepair. Nothing now remains of the house. The Visitor Centre is located in what was originally the farm yard and kitchen gardens of the estate. The stables and many of the farm buildings have been restored and now house the craft units and the education facilities. The original walled garden is now home to a small herd of Fallow and Sika Deer and a flock of Jacob Sheep. Like many large landowners at the time, the Wandesforde family spent time improving their grounds to create an idealised landscape. One major part of this was the construction of two artificial lakes, which would have been used for fishing and boating. The lakes were drained in the 1980s and the surrounding vegetation had gradually taken over. In 2004, the lakes were re-instated as part of the restoration and clearance of the woodlands. A replica of the Wandesforde family boathouse has also been constructed on the original site on the lower lake. 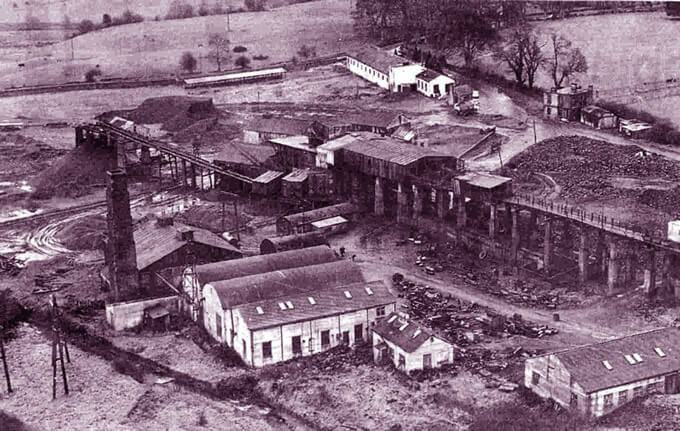 Mining in Castlecomer began in the mid 17th Century with the extraction of iron ore. Huge areas of oak woodland were cleared to feed the smelting furnaces. At this time coal was not used as the process of coking coal for the furnaces hadn’t been developed yet. Iron was generally found as nodules known as iron balls in the shale deposits of the area. In later years coal deposits were found beneath the shale and these were to form the basis of the coal mining industry in the area which lasted for over 300 years. In the mid 17th century, Christopher Wandesforde, from Yorkshire was invited to Ireland by the Lord Lieutenant and granted a large estate in Castlecomer which included the Castlecomer coalfield. The Wandesforde family were responsible for the opening up of a number of coal seams and over time earned quite a large fortune from coal mining. In the early days, the land was leased out to middle men who employed miners to dig the coal. Overseers were employed to watch for illegal mines but some people managed to work small scale mines for a time by keeping the entrances hidden. The Leinster Coalfield is centred on Castlecomer and extends into counties Laois and Carlow. The coal seams were often quite narrow but the coal itself was very high-quality anthracite with a low sulphur content. There were three separate seams worked in the area at different times with a number of pits operating in each seam. The Old Three Foot Seam – The first coal seam to be worked in Castlecomer, the Old Three Foot seam was found at depths of between 15 and 45 meters. This seam was worked using Bell Pits until 1815 when the coal was exhausted. The Jarrow Seam – Once the original coal was exhausted, the Wandesforde family enlisted the help of geologists to search for more coal and they located the Jarrow seam. This was in the shape of a horseshoe with coal up to 1.2m thick in the centre and thinner at the edges. The Skehana Seam – In the early 20th Century, a deeper seam was discovered at Skehana, which contained some of the best quality anthracite in the world. A number of pits were opened up in the Skehana seam including the Deerpark. The Deerpark was the largest and deepest of the pits in the area and was the last to close, remaining open until 1969. In the early days, mining was carried out through the use of bell pits. Two shafts were sunk up to 150 feet (45 metres) apart and joined by a connecting tunnel for air. The miners would then go down the shaft and start digging out the coal on either side of the connecting tunnel with pillars of coal left in place to support the roof. 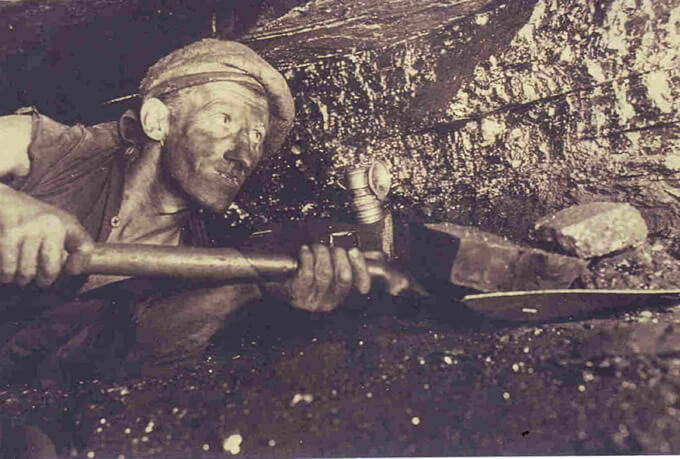 Because the coal seams were often quite thin, many of them only 18 inches (45cm) thick, the coal miners often had to work on their sides ‘colliering’ or digging out coal from the coalface with a pick for up to 8 hours per day. The coal was then brought to the bottom of the shafts by men dragging sleds filled with wooden boxes of coal, and winched to the surface by hand. The coal sleds were pulled using a ‘Gurl and Swivel’, which consisted of a heavy leather belt worn around the waist with a hook attached to the sled. In later years, mining became more mechanised with the use of coal cutters and electric conveyor belt and rope systems for transporting the coal. Because of these improvements and the addition of pumps for removing water from the mines and fans for circulation of air, mining could be carried out on a larger scale. 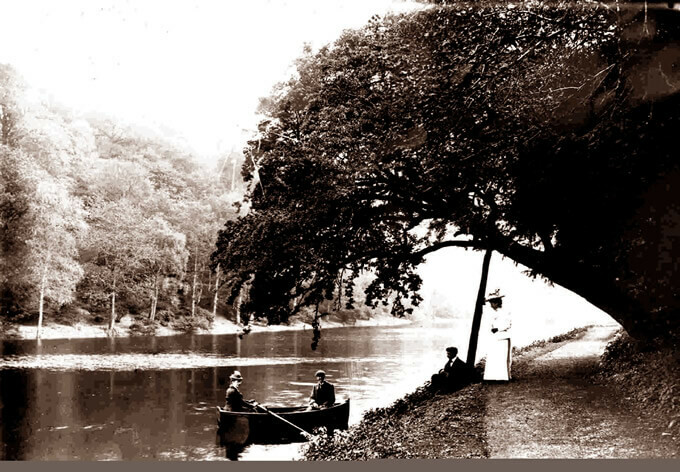 When Captain R. H. Prior-Wandesforde inherited the estate in the late 19th Century, the family owned thousands of acres of woodland in the area. In previous years, the mines had been operated by master miners who leased the mines from the Wandesforde family, but ‘The Captain’ took personal control of the mines. Conditions in the coal mines were very difficult and many workers were dissatisfied with their pay, housing conditions and lack of washing facilities. In the 1920s, Nixie Boran and some of the local miners formed a branch of the ‘Revolutionary Workers’ Group’. 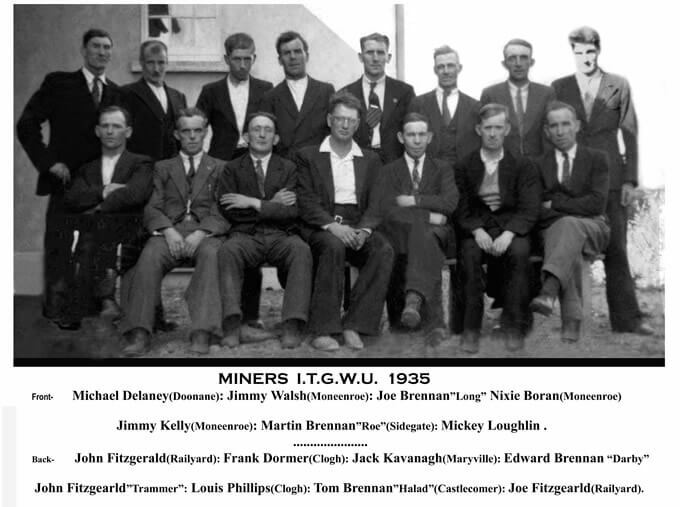 After a visit to Russia, for which he had to be smuggled out of the country, Nixie Boran returned to Castlecomer and the ‘Castlecomer Workers’ Union’ was formed and later renamed as ‘The Irish Mine and Quarry Workers’ Union’. The union sought to improve pay and working conditions for the miners but was strongly opposed not just by the mine owners but by many local people, including the clergy, because of its supposed communist connections. Over the years, there were many strikes and disagreements with management, but these eventually led to improvements in pay rates, the introduction of showers and lockers and improvements in mechanisation and working conditions. Seamus Walsh's Books Now Available to Buy Online! “Coal in the Blood” Now Available to Buy Online! Coal in the blood is a true story from the mines it tells of the hardship the strife strikes and vindication over a long number of years. Seamus wrote about life in the mines in his book “In the Shadow of the Comer Mines” a hugely popular account of lie in the mines and in Castlecomer. We are delighted that Seamus has penned further memoirs in his latest book “Coal in the Blood”. Acclaimed Author J.V.A.Robinson has given it a great endorsement. 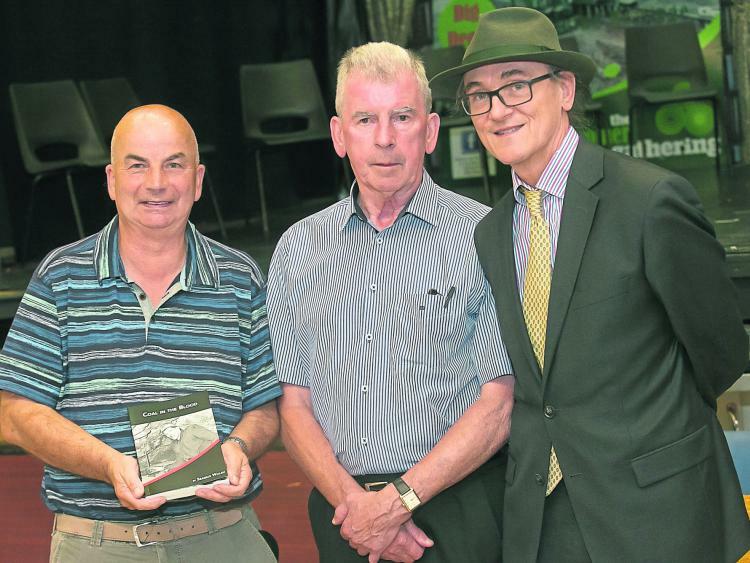 ‘Whereas Seamus Walsh’s previous book was about interesting mining characters in the Castlecomer district, this book not only continues in that vein, but is even more a document, and valuable for being so. Mining historians of the future will have access to a very informative source when it comes to continuing the thread of information that this work has established in so much detail. It provides the kind of stuff that has been lost about countless pits in Ireland, England, Scotland, Wales and elsewhere. The policy of deliberate ‘forgetting’, of letting the written accounts deteriorate, get lost or simply dumped over the years, is a very efficient way of erasing memories of actions by mine-owners, local councils and governments who do not want – and have never wanted – their behaviour over the generations to be preserved for posterity. Not only is this book a written memory, it is also a very graphic one, with many photographs of some of the great men who sacrificed themselves, working under terrible conditions to make Britain rich and powerful. Men – and their womenfolk – who laboured and suffered for a cause they received neither gratitude nor credit for; indeed, these wonderful, tough, skilled and courageous men were commonly despised, regarded as low-lifes simply because throughout the greater part of industrial history they had to walk home covered with dirt and dust. Yet they were human beings whose humanity, among other virtues, has never been surpassed. We are now selling both titles from Seamus Walsh on line. You can purchase “Coal in the Blood” or “In the Shadow of the Mines” by clicking on the link below.